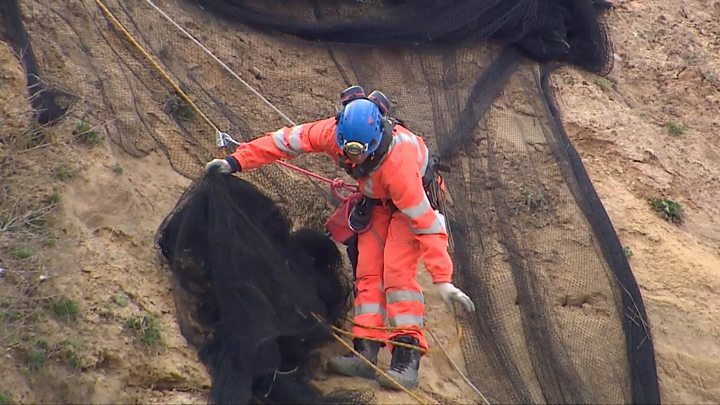 Nets installed on sea cliffs to prevent sand martins nesting are an "atrocity", TV naturalist Chris Packham has said. North Norfolk Council put them up in Bacton to encourage the birds to nest elsewhere - work has since started to remove the nets. The birds have flown half way around the world from Africa to return to sites they know have the resources they need to breed, the broadcaster said. He said the council was now undoing a problem that "should never have been". "Every spring I see them flying over my house, probably on their way to north Norfolk," Packham said. "The birds arrive exhausted to sites they know have resources to sustain them. To survive, birds will have up to three broods because predation and disease cuts numbers. "They will not have energy or time to find new sites so many may fail to breed." Packham welcomed protests by members of the public on social media. The RSPB has welcomed the nets' removal but has other concerns about the sand martins. A scheme to lay down sand to prevent erosion will see beach levels rise by 25ft (7m), leaving the birds' nests in danger of being swamped, the RSPB said. The nets stretch for just under a mile (1.3km) along the beach where sea defences are being installed, but the RSPB wants this reduced to a 160ft (50m) section. "The onus is on North Norfolk District Council to make the final decision for the birds' sake," spokesman Fabian Harrison said. A council spokesman said the scheme was "designed to protect hundreds of homes in Bacton and Walcott, as well as Bacton Gas Terminal".